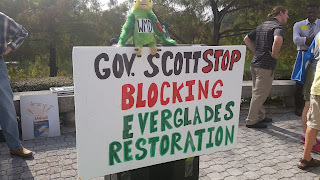 West Palm Beach, FL -- More than 40 protesters chanted and waved signs outside Governor Rick Scott’s South Florida water managers last meeting of 2016, a year in which Florida’s toxic green algae catastrophe made headlines around the world. The protesters called on Scott to support Florida Senate President Joe Negron’s plan to purchase 60,000 acres of sugar fields to store and treat billions of gallons of polluted water. The nutrient-rich water, which wiped out marine life on Florida’s east and west coasts last summer, would be treated and sent south to the parched Everglades. 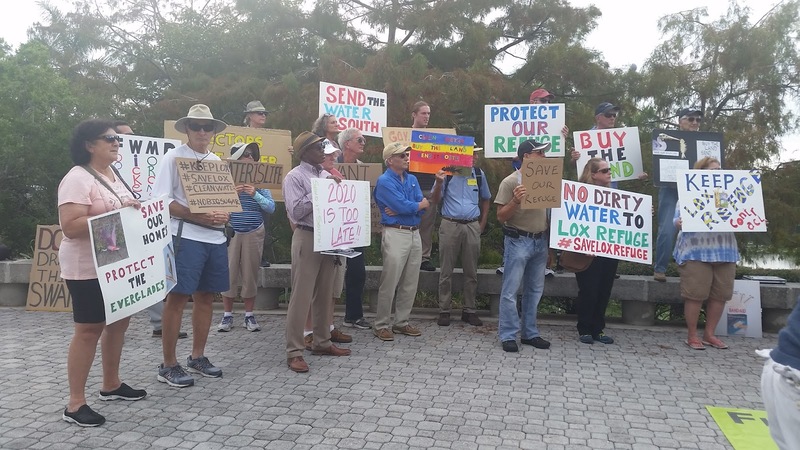 Protesters also blasted Scott’s intention to eliminate the Loxahatchee Wildlife Refuge, which could allow polluted water to be dumped there. If carried out, it would be the first time in U.S. history that a coveted National Wildlife Refuge has been removed since Theodore Roosevelt established the first at Pelican Island, Florida, in 1903. A parrot puppet sits upon a sign. The event, organized by Sierra Club, Bullsugar.org, Indian Riverkeeper, and Caloosahatchee Riverwatch, stressed that clean water is a human right. “Water is life, and Scott is selling our water protections and quality to billionaire polluters to increase their profits,” said Marty Baum of Indian Riverkeeper. Governor Scott’s water managers “simply do the bidding of sugar growers rather than advocate for the millions of South Florida taxpayers who are adversely affected by health-threatening algal blooms and looming drinking water shortages,” said Captain Mike Connor of Bullsugar.org. Some protesters’ signs read: Governor Scott, Stop Blocking Everglades Restoration, No Dirty Water to Lox Refuge, Buy the Land, Send Water South and We have the right to Clean Water. Press: WPBF ABC 25 News coverage of the protest.